Thousands of Moroccan Sahrawis gathered Saturday night outside the headquarters of the MINURSO in Laayoune, Western Sahara, to demand the departure of the UN mission. The demonstrators told journalists on the spot that the presence of the UN mission in Western Sahara has become irrelevant since the overwhelming majority of Sahrawis are firmly attached to the Sahara as a Moroccan territory and reject any option harming the Kingdom’s integrity. They insisted that they deem the autonomy initiative is the only solution to the Western Sahara regional conflict opposing Morocco and the Algeria-backed Polisario Front. “MINURSO has nothing to do in Morocco” was among the slogans chanted by the demonstrators who also denounced the leaders of the Polisario and the Algerian regime for their hegemonic and expansionist ambitions at the expense of Morocco’s territorial integrity. The demonstration was staged in the wake of the speech King Mohammed VI delivered Friday, November 6, in Laayoune, on the occasion of the 40th anniversary of the Green March. He reaffirmed that Morocco is not ready to make any new concessions other than autonomy in the settlement process of this territorial dispute. 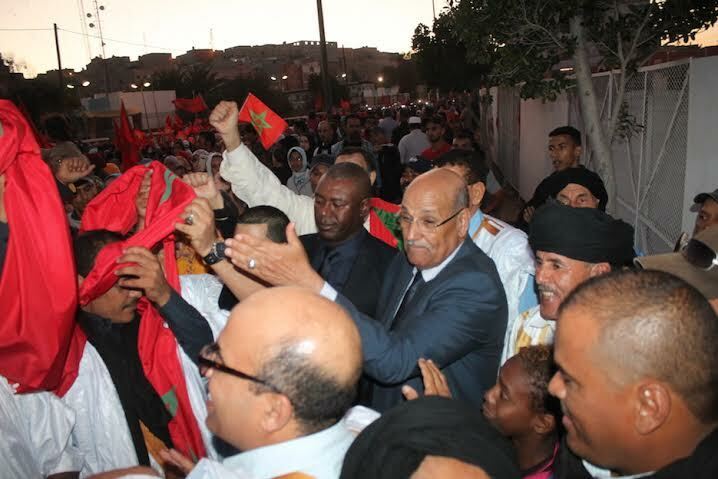 More than 30,000 inhabitants of the Moroccan southern provinces, including elected representatives, notables, tribe leaders, civil society players, have spontaneously flocked to the MINURSO headquarters. The president of Laayoune Municipal Council, Moulay Hamdi Ould Errachid, an influential member of the R’guibat tribe, said the demonstration is intended as a strong message to the international community reaffirming that autonomy is the only viable solution to the Western Sahara regional conflict. The demonstrators also called on the international community to put more pressure on the Polisario and Algeria to release the Moroccan Sahrawis forcibly held in the Tindouf camps in Algeria. King Mohammed VI who began his visit in Laayoune Friday evening, presided over, Saturday, the launch ceremony of large-scale structural projects in socio-economic sectors that will generate wealth and create jobs. The King had explained in his Friday speech that these projects are part of the new development model initiated for Morocco’s southern provinces in the wake of the launch of the ambitious advanced regionalization plan following the municipal and regional elections of September 4. King Mohammed VI who was driving his private car through the town, without any formalities, found himself suddenly surrounded by hundreds of demonstrators who were gathered outside the MINURSO headquarters demanding the departure of the UN mission from the Sahara. At the sight of King Mohammed VI, the demonstrators rushed to greet him, expressing their joy and chanting cheers to the address of the sovereign, and also their commitment to the Moroccan Sahara. This extraordinary scene took place under the eyes of the MINURSO observers who could thus see from the windows of their offices, the unwavering attachment of the Sahrawi people to their king and their commitment to their country.